The Hackensaw Boys, Making Their Own Kind of Music Shiner, Salvage, Mahlon, Four, Baby J and the Kooky Eyed Fox — together they're the Hackensaw Boys. They perform their own brand of bluegrass, with instruments collected in their many travels. They tell Scott Simon about a new release, Love What You Do. Shiner, Salvage, Mahlon, Four, Baby J and the Kooky Eyed Fox — together they're the Hackensaw Boys. They perform their own brand of bluegrass, with instruments collected in their many travels. They tell Scott Simon about a new release, Love What You Do. Salvage Hackensaw, Dante J Hackensaw, Shiner, Mahlon and Four(ph) Hackensaw, the Kooky-Eyed Fox. With names like those, a band would have to sound like this. HACKENSAW BOYS (Bluegrass Band): (Singing) Well, I was parking cars out on sorority row, where all the pretty women are like the virgin snow. They're like a mountain stream, they got no thoughts at all. SIMON: That's "Parking Lot Song" by the Hackensaw Boys, from their new CD "Love What You Do." We're joined here in Studio 4A by the entire band, all at once. Unidentified Band Member: Thank you. Unidentified Band Member: Thank you very much. SIMON: Come on, guys, you can do better than that, can't you? SIMON: Well, can I ask each of you to identify yourselves, I guess by stage name and real name, or at least stage name and the instruments you play? MAHLON HACKENSAW (Hackensaw Boys): Sure. My name's Mahlon Hackensaw, but my wife knows me by Robert Bullington, and I play a mandolin in the Hackensaw Boys. SALVAGE HACKENSAW (Hackensaw Boys): I'm Salvage Hackensaw, and I play a pile of junk in the Hackensaw Boys. SIMON: We want to talk about the pile of junk, yeah. SHINER HACKENSAW (Hackensaw Boys): My name's Shiner Hackensaw, and I play the guitar. DANTE J HACKENSAW (Hackensaw Boys): My name's Dante J Hackensaw, known as Jesse Fiske in the real world. I play the bass harmonica and some accordion. FOUR HACKENSAW (Hackensaw Boys): They call me Four Hackensaw. My mama calls me Third, and I play the fiddle and the bass. Have a big time doing it, hey. KOOKY-EYED FOX (Hackensaw Boys): My real name's Jimmy Stelling, and I'm the Kooky-Eyed Fox. SIMON: Now you guys aren't brothers at all, are you? SHINER: Only if driving in a van all year makes you brothers, we are definitely brothers. MAHLON: We smell like brothers, yeah. SIMON: ...right? You're our designated spokespersons today, I understand it? SIMON: OK. How--tell us how you came up with the name of the band. Where's that come from? MAHLON: ...and after about a week and you've played six or seven shows during the course of that week, you have no choice but to keep the name. And it originated with the play on words. And you can't see me, of course, because this is radio, but I would be hacking at a mandolin and, say, sawing at a fiddle. MAHLON: Hack and saw. And six years later, we're the Hackensaw Boys. There you go. SIMON: And what got the six of you together? SHINER: I guess fate, and just the love of music and the small town, Charlottesville, Virginia, where we started. We just all had a similar goal, which was to play music and make people feel good, and we're still trying to do that. SIMON: ...without further delay. Could we hear "Cannonball"? SHINER: Absolutely. Come on, Mahlon. MAHLON: All right, let's bring in this song now called the "Cannonball Breakdown." It's all about disasters, and we're going to do it for you now in the key of G. Here we go. Unidentified Band Member: Two, three, four. HACKENSAW BOYS: (Singing) There's money in tobacco and a fortune to be made selling recycled engines and video arcades. Shame we all can't profit from the measure of our times, we're paying for the wisdom of our crimes. Well, a (unintelligible) education may liberate your mind, leave you stranded in the flood for bearing on that ride. Gather around me children and I will tell you all about the beautiful disaster they called the cannonball. Cannonball, cannonball. Well, tell the truth, can you hear Mama call, call, call? Cannonball, cannonball. Where'd you go? It took 1,500 horses just to keep her on that line. She ran on radiation (unintelligible). In Alaska they got oil, but in Florida turpentine is paying for the wisdom of our crimes. Whoo! She came out of that gate like she left all behind. She pulled up from the start and through that finish line. They thought they'd make a killing if she didn't ...(unintelligible) try to fall, for they did not know that mighty cannonball. Cannonball, cannonball. Well now, tell the truth, can you hear Mama call, call, call? Cannonball, cannonball. Well, there she goes. Whoo! In the glory of the mud pen they heard her final cry all the way from downtown Madgel(ph) to the halls of Columbine. Her ...(unintelligible) feeling sorry for the creatures great and small who rode atop that mighty cannonball. Cannonball, cannonball. Well now, tell the truth, can you hear Mama call, call, call? Cannonball, cannonball. Well, there she goes. They wrapped her up in plaster polish, threw a perfect shine, and they laid her in her grave with a crate of soda and lime. Nothing left delivered for and under to her call, the lessons of that mighty cannonball. SHINER: You're welcome so much. SIMON: Mahlon, could I ask you to switch places with Salvage for just a second? SIMON: ...hair spray or something? SALVAGE: ...breath mints, bike bells. SALVAGE: ...around the United States. SIMON: So you keep adding your instrument? SALVAGE: Well, I usually just make them and break them and then make a new one. It's kind of ever-evolving, sort of ever-changing. SIMON: Well, I don't mean to put you on the spot, but could we hear a quick riff solo on the pile of junk? SIMON: That's all right! Thank you very much. SALVAGE: It's something like that, anyway. SIMON: Best pile of junk I've heard. Well, thank you. SIMON: ...yes. How do you wind up playing the mandolin? MAHLON: When we started the band about five and a half, six years ago, I happened to be the one who had a mandolin because I had inherited it from my great-uncle, who was in a band called the Roanoke Jug Band back in the '20s. So I had his guitar and his mandolin. I had never really thought about playing the mandolin, but I had one, and therefore I became the mandolin player. And as these guys will tell you, I've been learning how to play it ever since. SHINER: You're doing a great job, Robert. You're doing a great job. MAHLON: That's the old-time line. SIMON: Even I could tell that. Well, if we could get you to play the song "Sun's Work Undone." SHINER: Ready? Here we go. HACKENSAW BOYS: (Singing) What I want you to know is how much I love you. I place no one above you, you're always in my head. And on the day you were born, something inside of me grew, and something inside of me knew that I had done the right thing. And you did what you did. You had your own reasons. It was your season. I believe it was your spring. And the rains, they did come, left the sun's work undone. And the flowers are happy for the changing. And I knew in my heart, babe, someday we would part, and now it's worth all the waiting. Through straw fields and mountains green and misty, it was our history, the songs that we were sung. And it did not go the way that I prayed for, the way that I stayed for 'cause I said I would. And on the day you were born, something inside of me grew, and something inside of me knew that I had done the right thing. And the rains, they did come, left the sun's work undone. And the flowers are happy for the changing. And I knew in my heart, babe, someday we would start, and now it's worth all the waiting. And the rains, they did come, left the sun's work undone. And the flowers are happy for the changing. And I knew in my heart, babe, someday we would start, and now it's worth all the changing. And now it's worth all the changing. And now it's worth all the waiting. SIMON: Where do you find you wind up touring, performing? MAHLON: ...as a matter of fact. Yeah. We--all over, literally. SHINER: ...crossed the country many times. MAHLON: ...of The Louvin Brothers. And that was definitely a very intense and bountiful experience for us to work with him. SIMON: Well, what did you learn from him? MAHLON: Mostly, to tell you the truth, I learned about stage presence from him, about getting up and testifying to a group of people even if they've never heard of you before, even if most of them were born after your career was kind of over, you know? And to just stand up there and to testify and make them believe. And every night he killed them. Every night he did a great job. SIMON: Yeah. Where do you folks see yourself fitting into the music scene? MAHLON: I think we'll probably fit on the street corner because that's where we started and that's where the music kind of derives its energy from is being able to stand on a street corner and draw a crowd with just your instruments and your voices and nothing between you and the people walking past. SIMON: We want you to play us out on a certain song, but first I just want to thank you all very much for being with us. SHINER: Thank you very much. Unidentified Band Member: Thanks for having us. SIMON: Thanks for all your--do you mind your real names being known here, at the end here? 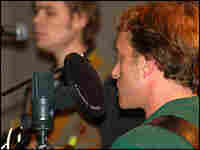 SIMON: ...Justin Neauhardt and Jimmy Stelling. Thank you so much for being with us. Unidentified Band Member: Thanks, Scott. Unidentified Band Member: Thank you, Scott. SIMON: Their new release is called "Love What You Do." Joining us here in Studio 4A, the Hackensaw Boys. And could we ask you to take us out on "We Are Many"? SHINER: Yes, sir. Let's get down to it, fellas. HACKENSAW BOYS: (Singing) Our names (our names) are unimportant (are unimportant) where we live (where we live) we're looking for (we're looking for). What we know (what we know) and do believe in (and do believe), it's the love (it's the love) of a friend (of a friend). Now on your left (on your left) is your brother (that's your brother). On your right (and on your right), that's your sister (that's your sister). Right behind you (right behind you), that's your family (that's your family). Right in front of you is your life to live. (Unintelligible) low and ...(unintelligible) goodbye, woke this morning where the children lie. Just this morning I was thinking about you, want to thank you for all the things that you do. Want to thank you for the moon above, want to thank you for the stars that I love. Shine down on us now and show us somehow. Once we've learned, we can stop them. Ho! Ho-rah! You all help me out now! Our names (our names) are unimportant (are unimportant) where we live (where we live) we're looking for (we're looking for). What we know (what we know), we do believe in (we do believe in), it's the love of a friend. Now on your left (on your left) is your brother (that's your brother). On your right (on your right), that's your sister (that's your sister). Right behind you (right behind you), that's your family (that's your family). Right in front of you is your life to live. On your left (on your left) is your brother (that's your brother). On your right (on your right), that's your sister (that's your sister). Right behind you (right behind you), that's your family (that's your family). Right in front of you is your life to live. Now on your left (on your left) is your brother (that's your brother). On your right (on your right), that's your sister (that's your sister). Right behind you (right behind you), that's your family. Right in front of you is your life to live.